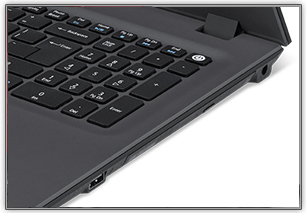 EasyNote TE notebooks are slim and easy-to-use. They keep you mobile, connected and productive by making everyday tasks a snap, and can also easily handle your entertainment needs. 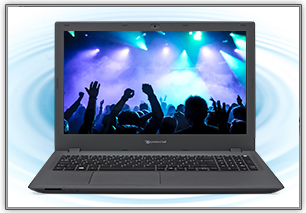 With a portable design that makes them easy to carry, EasyNote TE notebooks are among the thinnest in the category, but still include an integrated DVD-RW drive1. And then there’s all that style with a beautiful textile-inspired pattern on its cover. It also features a new and clever undercut design that makes opening the lid much easier. 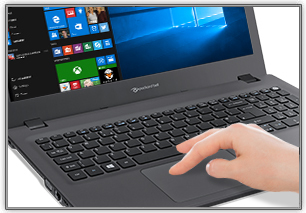 Tasks are completed faster thanks to the improved accuracy of the Precision Touchpad, which lets you enjoy smoother zooming and scrolling with fewer unintended inputs. What’s more, with 802.11ac MU-MIMO wireless networking you’ll enjoy faster connection speeds, and with Power-off USB charging you can easily charge up all your mobile devices, even when the notebook is off. Save precious desktop space at home and keep your entertainment with you as you go. Enjoy movies anywhere with its vivid and spacious 15.6" HD anti-glare screen and DVD-RW1 drive. Stereo speakers deliver fuller sound, and media keys make control easy.